Theatrhythm Final Fantasy Curtain Call Collector’s Edition will be exclusively available through the Square Enix store in North America and Europe. The North American release is limited to 5,000 units and features a different box art to the European version. A limited edition version is also available which includes a five-track music CD pre-order bonus. The Collector’s Edition is only available via Square Enix’s online store, priced at £44.99 GBP / € 54.99 EUR / $69.99 USD. Pre-orders can be placed here via the EU store or NA store. Australians won’t be able to pre-order it unfortunately due to region restrictions and availability in Europe is limited to certain countries only. 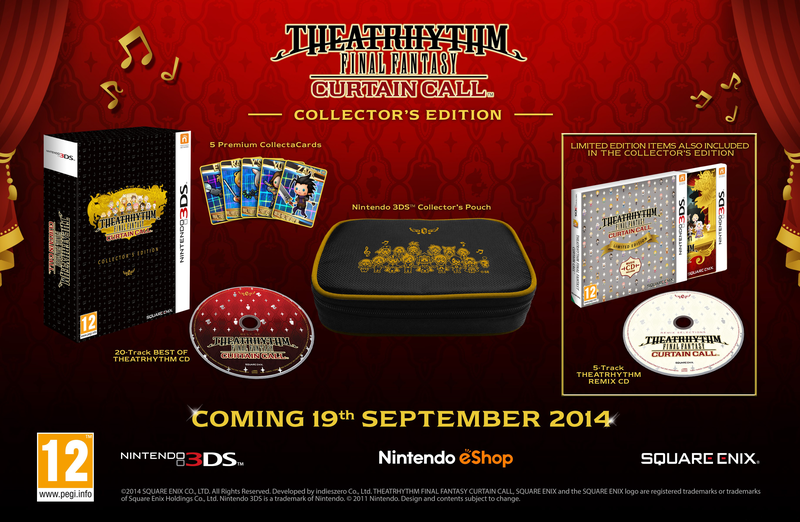 Theatrhythm Final Fantasy Curtain Call launches on September 19th, 2014 in Europe and on September 16th, 2014 in North America.